The Gold Branch trail is part of the Chattahoochee River National Recreation Area system. 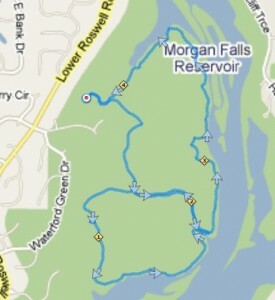 It is a nice, quiet loop of single-track trails through a heavily wooded area. The trail curves down to Bull Sluice Lake and follows the edge of the lake for a good distance. There are great views here and it is a great place to escape the city. The parking lot is off Lower Roswell Rd and is easy to miss. Once you park you will see the trail-head at the corner of the lot heading down into the woods. There are maps posted intermittently throughout the park, but this one will give you a good idea of the layout. There are great lake views, swamp areas, boardwalks and wooded paths. There are a total of about 5 miles of trails here and some are more clearly marked than others. I found it was easy to follow a nice, well groomed trail straight into a very narrow trail around rocks and trees next to the lake. It is a great place to do some trail running, but watch out for roots and rocks. Take exit 6 – Northridge Road. Stay in right lane merging onto Dunwoody Place, go 1.3 miles. Turn right at Roswell Road, go 0.6 miles. Turn left at Azalea Drive, go 1.7 miles. Turn left at Willeo Road, go 1.4 miles. Turn left at Lower Roswell Road, go 0.7 mile to park entrance on the left. Continue straight onto Dunwoody Place, go 1.3 miles. Take exit 263 for GA120 Loop. Merge right onto GA 120 Loop, E/South Marietta Parkway SE, go 1.2 miles. Exit GA 120 Loop for GA 120 E/Roswell Road. Turn right at GA 120 E/Roswell Road, go 6.1 miles. Turn right at Timber Ridge Road, go 1.4 miles. Continue straight onto Lower Roswell Road, go 0.7 miles to park entrance on the left. Take exit 265 for GA120 Loop. Turn left at GA 120 Loop/North Marietta Parkway NE, go 1.4 miles. Turn left at GA 120 E/Roswell Road, go 6.1 miles. Take exit 24 – Riverside Drive NW. Turn left at Riverside Drive NW, go 2.3 miles. Turn left at Johnson Ferry Road NW, go 1.8 miles. Turn right at Lower Roswell Road, go 2.2 miles to the park entrance on your right. Turn right at Riverside Drive NW, go 2.2 miles.